After his first CD featuring Beethoven’s piano sonatas No. 21 (“Waldstein”) and No. 29 (“Hammerklavier”), Sunwook Kim’s third solo CD with Accentus Music presents an impressive interpretation of Ludwig van Beethoven’s three most well-known piano sonatas: “Pathétique” (No. 8), “Moonlight Sonata” (No. 14), and “Appassionata” (No. 23). Sunwook Kim, who won the first prize at the Leeds International Piano Competition in 2006, has matured to become a subtle and accomplished Beethoven specialist – not least thanks to his partnership with the Beethoven House in Bonn, whose unique collection he regularly consults in his preparation of Beethoven’s works. 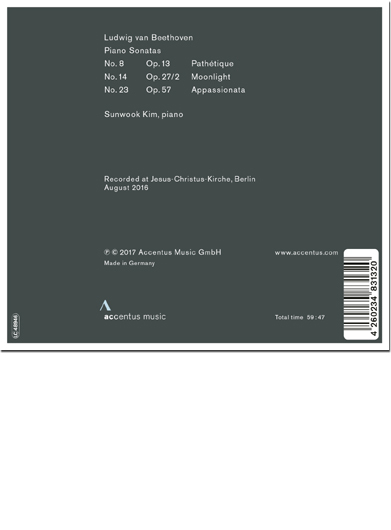 Sunwook Kim stays close to the original score, yet nevertheless provides a very personal interpretation, which reveals a new and exceptional reading that stands out from the abundance of existing recordings of these three piano sonatas.